Vacuum Tumbler BVRJ-350 - Hangzhou Expro Machinery Engineering Co.,Ltd. 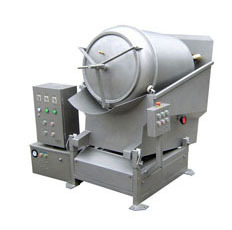 BVRJ-350 vacuum tumbler massages the fresh lumps under vacuum condition, the meat is tenderized, so that it absorbs full brine and dissolves the protein. This machine is equipped with mechanical stepless speed regulation system and hydraulic overturn device. In order to be convenient loading, operating and unloading, necessary state functions have been set. The drum of the machine can be separative. Different paddle structures can be chosen by customer in order to satisfy different products requirements.